When Jimi Hendrix transfixed the crowds of Woodstock with his gripping version of "The Star Spangled Banner," he was building on a foundation reaching back, in part, to the revolutionary guitar playing of Howlin' Wolf and the other great Chicago bluesmen, and to the Delta blues tradition before him. But in its unforgettable introduction, followed by his unaccompanied "talking" guitar passage and inserted calls and responses at key points in the musical narrative, Hendrix's performance of the national anthem also hearkened back to a tradition even older than the blues, a tradition rooted in the rings of dance, drum, and song shared by peoples across Africa. Bold and original, The Power of Black Music offers a new way of listening to the music of black America, and appreciating its profound contribution to all American music. Striving to break down the barriers that remain between high art and low art, it brilliantly illuminates the centuries-old linkage between the music, myths and rituals of Africa and the continuing evolution and enduring vitality of African-American music. Inspired by the pioneering work of Sterling Stuckey and Henry Louis Gates, Jr., author Samuel A. Floyd, Jr, advocates a new critical approach grounded in the forms and traditions of the music itself. He accompanies readers on a fascinating journey from the African ring, through the ring shout's powerful merging of music and dance in the slave culture, to the funeral parade practices of the early new Orleans jazzmen, the bluesmen in the twenties, the beboppers in the forties, and the free jazz, rock, Motown, and concert hall composers of the sixties and beyond. 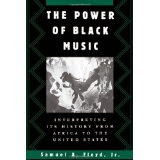 Floyd dismisses the assumption that Africans brought to the United States as slaves took the music of whites in the New World and transformed it through their own performance practices. Instead, he recognizes European influences, while demonstrating how much black music has continued to share with its African counterparts. Floyd maintains that while African Americans may not have direct knowledge of African traditions and myths, they can intuitively recognize links to an authentic African cultural memory. For example, in speaking of his grandfather Omar, who died a slave as a young man, the jazz clarinetist Sidney Bechet said, "Inside him he'd got the memory of all the wrong that's been done to my people. That's what the memory is....When a blues is good, that kind of memory just grows up inside it." Grounding his scholarship and meticulous research in his childhood memories of black folk culture and his own experiences as a musician and listener, Floyd maintains that the memory of Omar and all those who came before and after him remains a driving force in the black music of America, a force with the power to enrich cultures the world over.